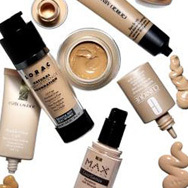 Searching for the best foundation makeup to suit your skin color, skin type, coverage needs, and other personal preferences can feel like an endless quest. Let us help you discover the benefits of the different types of foundations so you can find your perfect match. Just because a foundation looks great on your friend or looks like a good match in the bottle, doesn’t mean it’s going to be the right fit for you. It’s extremely important to choose a foundation that balances the needs of your particular skin type and skin concerns, and matches your skin color perfectly. To help you narrow down the choices, we created a guide to the most popular types of foundations so you can find your perfect match. Lightweight texture and finish (doesn’t feel heavy on skin). Typically easy to blend; buildable coverage. Excellent for holding back excess oily shine. Generally a safe choice for covering blemish-prone skin. Beneficial for those who live in humid climates and cannot get their foundation to last. Attempting to blend mistakes after it sets can cause rolling or streaking, which is hard to correct. Typically provide light to medium coverage that allows for a natural look. The best for hydrating skin without being greasy. Satin or satin-matte finishes, perfect for normal to dry skin. Many have a slight sheen for a youthful-looking glow. Not the best option for oily skin because the moisturizing finish makes oily areas look even more oily. Best multitasking foundations, providing coverage and anti-aging ingredients that are beneficial for all skin types. Complement an anti-aging skincare routine to net you even better results. Some “anti-aging” serum foundations exaggerate their superstar ingredients’ benefits or include only minute amounts, so you’re not getting what you pay for. Fast, easy way to get a smooth finish for normal to slightly oily or slightly dry skin. Some powder foundations offer subtle luminescence for a soft glow. Pressed-powder versions are easily portable, for on-the-go touchups. Excellent for use over a daytime moisturizer with SPF to reduce the shiny finish of some sunscreens. If you have very oily skin, powder foundations can look clumpy or slip into pores. If you have dry or flaky skin, the powder will absorb moisture, making your skin drier. Powder’s pigmentation can change when it mixes with skin’s excess oil and oxidizes. Building coverage can look cakey or powdery. Easy to blend with a sponge or brush, and sets to a semi-matte or powdery finish. Ideal for normal to slightly dry or slightly oily skin if you don’t want a true matte or dewy finish. Wide range of coverage, from sheer to full. Work well for on-the-go touchups. Tend to look more heavy than other types of foundation. Not for very oily skin because the cream portion exaggerates shine and the powder finish isn’t strong enough to keep excess oil in check. Not for very dry skin because the finish exaggerates dry areas. Typically offer medium to full coverage to conceal imperfections. Works well for on-the-go touchups. Some stick foundations have a thick, waxy texture that looks heavy and can lead to clogged pores and/or worsen breakouts. Not always easy to blend over large areas. If the finish is too creamy, it can crease into lines around the eye. The sheer nature of tinted moisturizers (and many BB creams) makes it easier to match skin color because they tend to blend on almost invisibly. Often combines soft coverage, hydration, and sun protection in one product, for triple the benefit. Bonus if the formula contains skin-replenishing ingredients. Coverage can be too sheer for obvious imperfections. Now that you know what type of foundation makeup best suits your skin’s needs, the next step is finding your ideal shade. Use our guide to determine your skin’s undertone and hone in on your perfect match.